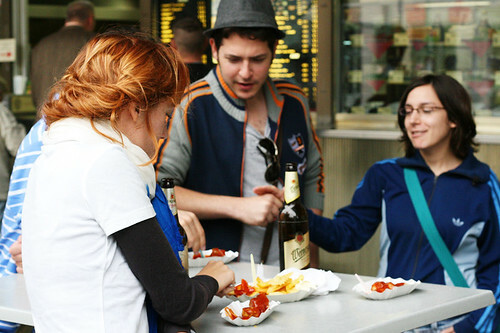 With an estimated 800 million servings sold each year in Germany, Currywurst is a national dish. And in Berlin, it’s impossible to tour the city without catching a whiff of it’s fried and saucy goodness. Peddled at many Schnell-Imbisse (fast food stall or cart) the Currywurst is colorful and flavorful. 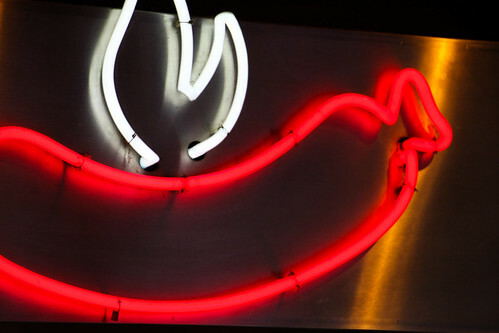 Dreamed up 60 years ago, Currywurst starts as a pork sausage with a destiny to meet the grease. Stalls around town each have their own method for cooking the wurst: shallow frying, deep frying, roasting, grilling, broiling. One of the best we had was first shallow-fried, and then dunked into the french fry vat to give it a sauce-proof crispy jacket. Next comes ketchup — lots of it. 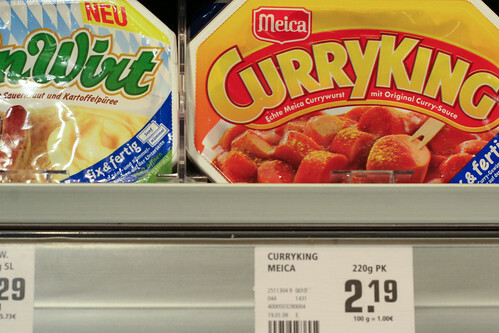 The sauce used to make Currywurst is attributed to Herta Heuwer in 1949 after she obtained ketchup, Worcestershire sauce and curry powder from British soldiers (thanks Wikipedia!). 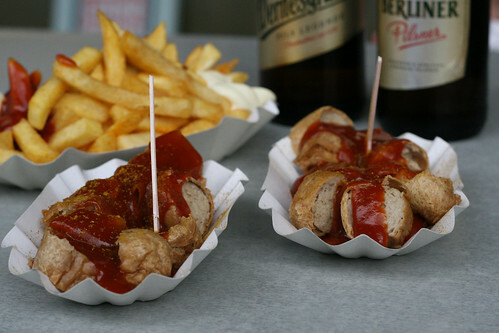 Currywurst is typically served alongside some fries and a cold beer. Sauces, like cooking styles, vary from stall to stall. Another notable difference between Currywursts is the sausage skin. 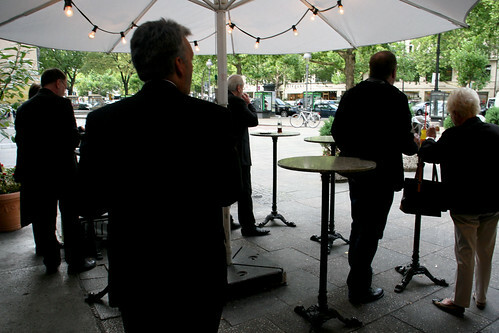 Apparently, among Berliners there is fierce debate as to whether the skin should be left on or off. 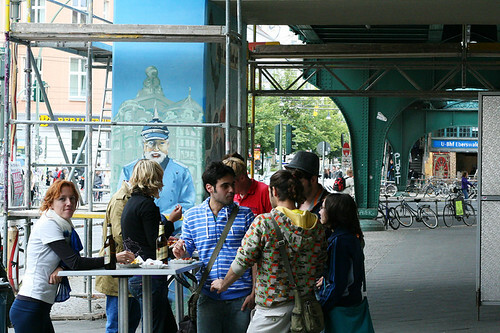 The best part of eating Currywurst are the fun stands and stalls all over town. Some cater to well-heeled fashionistas, and some catch subway commuters. The oldest place where we bit through the snappy skin and tremendous mess that is a Currywurst was at Konnopke’s Imbiss, underneath the train tracks at Eberswalderstrasse station, the U2 U-bahn line. 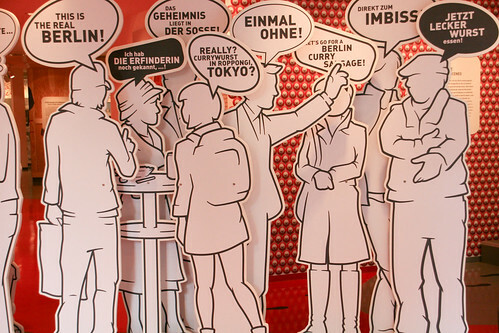 Currywurst’s fame and popularity haven’t gone unnoticed, and in August of 2009 Berlin opened it’s own Currywurst Museum. We checked it out and shook hands with the human-Currywurst attracting attention at the front door. However, with entry fees between 7-11 Euro, we couldn’t quite check it out for ourselves. Currywurst is available at German markets, but in case microwave pork sausage doesn’t strike your fancy, you can cook one up at home yourself. Heat 2 tbsp. canola oil in a saucepan over medium heat. Add 1 finely chopped large yellow onion; cook until soft, 8–10 minutes. Using hands, crush 2 cups whole peeled canned tomatoes (with juice) into pan. Add 1/2 cup sugar, 1/4 cup red wine vinegar, and salt to taste; stir well. Increase heat to high; bring to a boil. Reduce heat to medium-low and simmer, stirring occasionally, until thickened, about 25 minutes. Purée sauce in a blender until smooth. Strain sauce through a sieve. Serve hot over a grilled or shallow-fried sausage. Be sure to sprinkle some curry powder on top to give it some pizazz. Great post – currywurst is awesome, and i am so glad that there is now a decent german place that sells it in London (and just round the corner from my old office). Will have to try that recipe out when I get home! I wonder if we’d be able to find Currywurst in California? I have a craving for it again! Curry ketchup is one of the greatest inventions. Ever. Great post! I love currywurst. Skin on is my preference! We were in Berlin over Christmas and I swear I ate currywurst at least once a day. My most artery-clogging excursion into deliciousness was at a place called Barlin Curry XXL 37 (or something like that) where I had a currywurst as long as my arm — and I’m 6’4″!! Wish we found that place! That’s what I need in my Currywurst: more Currywurst! I hope the phenomenon starts spreading out of Germany for everyone’s sake! 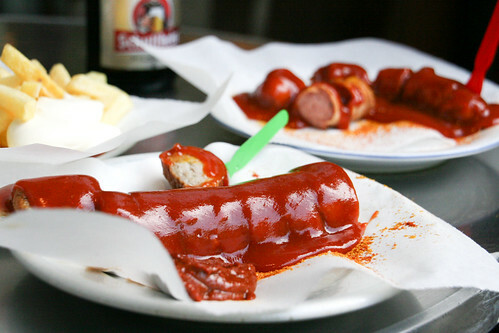 As your aticle mentions, Currywurst was invented by Herta Heuwer in Berlin in 1949 as an affordable but filling meal for the people of Berlin at a time when food was in short supply. When you order your Currywurst you can ask for it skin on “Currywurst mit Darm” or without skin “Currywurst ohne Darm”. Sausage casings were in short supply in the Soviet-controlled side of the city. If you grew up in East Berlin, you like sausage without skin; if you grew up in West Berlin, you probably prefer sausage with skin. I’m not from Berlin, I prefer Currywurst without skin and in my opinion the best place to get it is from Fritz & Co (a Currywurst stall) on Wittenberg Platz in the Schöneberg area of Berlin.